This page is dedicated to all Bingham librarians, past and present - to Rachel Melcher, who presides there now, and to Lela Cool, Grace Rollins, Nancy Hamlin Davis and Elizabeth Goodrich Jordan, so fondly remembered. Handwritten Cemetery Lists: The library has handwritten lists of persons buried in the cemeteries of many surrounding towns, with dates and inscriptions. Most of these appear to have been completed in 1992. They were compiled over several years by former librarian Nancy Hamlin Davis with the assistance of Ruth Hamlin, and given to the library. Scrapbooks: For many years, the Century Club has put together scrapbooks from obituaries and other newspaper clippings, souvenirs, pamphlets, etc. Old Photographs: Several volumes of photographs depicting events in Bingham and surrounding towns. Many photographs of the construction of Wyman Dam in the 1930's, logging, floods, reunions, etc. Old Post Card Collection: A large volume of postcards depicting various locations in Maine, including Bingham, Solon, Moosehead, etc. 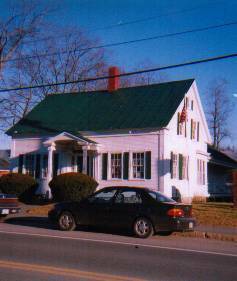 Town and Area Histories: The library has several town histories, some area histories, old maps, and other official town publications. Local histories include: History and Occupants of Main Street, Bingham ca. 1870 by E.W. Moore. Hotel Register: The original hotel register from the old Bingham Hotel.